to governments, funders, outside agencies and to the museum-going public. The American Alliance of Museums accreditation brings national recognition to a museum for its commitment to excellence, accountability, high professional standards and continued institutional improvement. “Accreditation is clearly a significant achievement, of which both the institutions and the communities they serve can be extremely proud.” Laura L. Lott, Alliance president and CEO. “During the last two years Imagine Children’s Museum’s Board and staff have worked diligently on the accreditation requirements. The process has made our institution stronger; helping to ensure the Museum will be here for generations to come. We sought to achieve accreditation to provide donors the highest level of confidence in our organization,” said Nancy Johnson, Executive Director of Imagine Children’s Museum. Accreditation is a very rigorous but highly rewarding process that examines all aspects of a museum’s operations. To earn accreditation a museum must meet stringent standards, submit extensive documentation, complete Strategic Institutional Planning and undergo an onsite review. Once the process is completed, it is reviewed by the Alliance’s Accreditation Commission for final approval. There are 33,000 museums in the U.S. including zoos, aquariums, science centers, botanical gardens, nature centers and all types of museums. 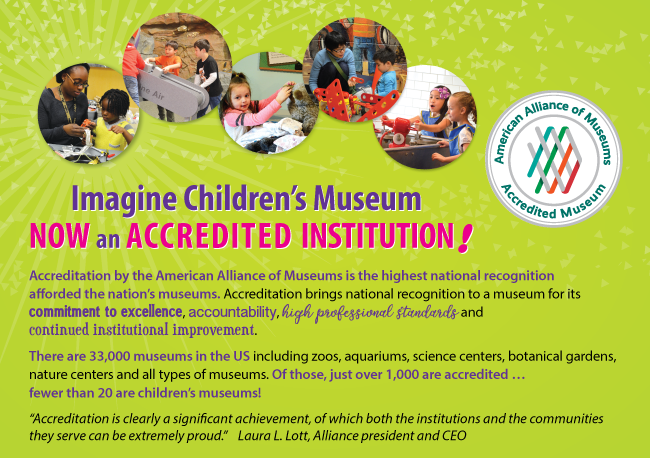 Of those, just over 1,000 are accredited, and fewer than 20 are children’s museums!